I have to say that one of the coolest parts about being a Fulbrighter is getting to meet other Fulbrighters. One of the current Norwegian Fulbrighters, Alyssa, happens to be the only conservation scientist in Norway and works at the Munch Museum. Alyssa graciously agreed to take me and another visiting Fulbrighter, Kyle, on a tour of the Munch museum and show us what she’s been working on. I have to say that I never really considered myself a Munch fan, so while I was not particularly excited to go through the museum, I was very excited to catch up with Alyssa and learn more about her work. Once Kyle and I checked into the museum’s staff entrance, Alyssa came out and brought us to her workspace. I have to say her office is probably the most exhilarating and terrifying places I’ve ever been. There were about a dozen Munchs that the conservationists were working on, and it’s probably the closest I’ll ever be to that many priceless paintings with no security in the immediate area. Needless to say, Kyle and I spent the whole time terrified that we’d end up accidentally damaging one of these paintings. Luckily we managed to be accident free. Sight: I was pretty impressed listening to Alyssa talk about how much you could tell by just looking at a painting. I for example could not quite see the difference between say cerulean blue and prussian blue, but am now impressed by those who can. Lighting: Putting the paintings under UV or infrared light can give conservationists an idea of what metals or other elements are in the paint, helping them guess at what specific paints were used. Other Instruments: We didn’t get to see this in action, but Alyssa says there are instruments they can use to can analyze the chemical composition of the paint without actually scraping any of the paint off. As for destructive methods, this involves taking minuscule pieces of paint off of the painting and them analyzing them directly. Alyssa told us that overall it’s much easier to analyze paintings that don’t have flat surfaces and don’t have a matte finishes since it’s easier to get samples. Alyssa also told us that Munch is a bit of a hassle to work with from a conservation standpoint, and that Munch provides them with a lot of interesting ethical questions. Munch believed in subjecting many of his painting to a “Kill or Cure” treatment, or leaving his paintings outdoors for a few years. If the paintings survived, Munch figured that they would last forever. But because these paintings underwent such harsh treatment, it leaves conservationists with the question of whether or not paintings should be restored to their original form, or left in their dilapidated post “Kill or Cure” state. There is even debate as to whether the bird droppings that have been left on these paintings are now part of the art or are something that should be removed. Munch is also a finicky artist in other ways. Some of his paintings have been left looking unfinished, which calls into question whether or not the unfinished paintings are in fact finished, or whether they are actually works in progress. Additionally Munch loved experimenting with different types of materials. 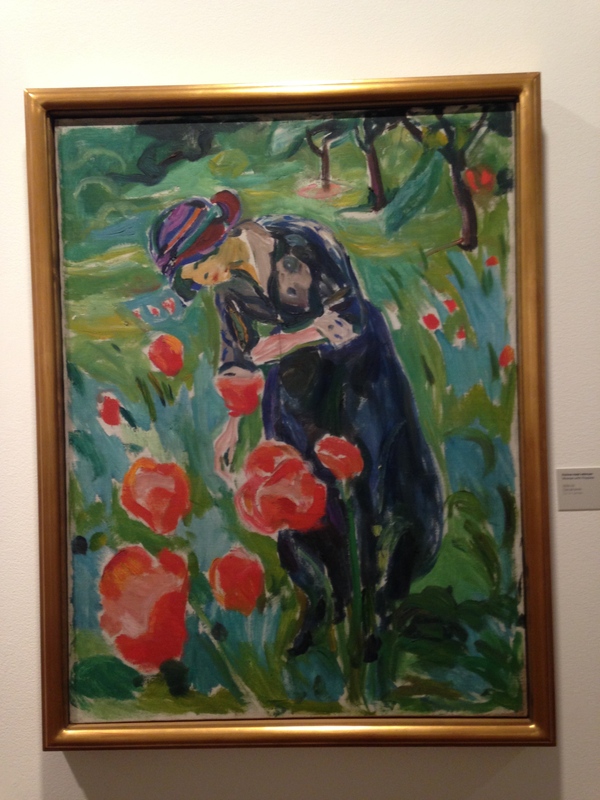 One of the paintings we saw is in a truly sorry state, partially because Munch painted the picture on cardboard. From Alyssa’s standpoint, Munch’s experimentation makes it much harder to figure out what exactly he put in his paint. Not only did Munch mix different ingredients into his paint, apparently the paint tubes that he used don’t always have accurate ingredients labels. 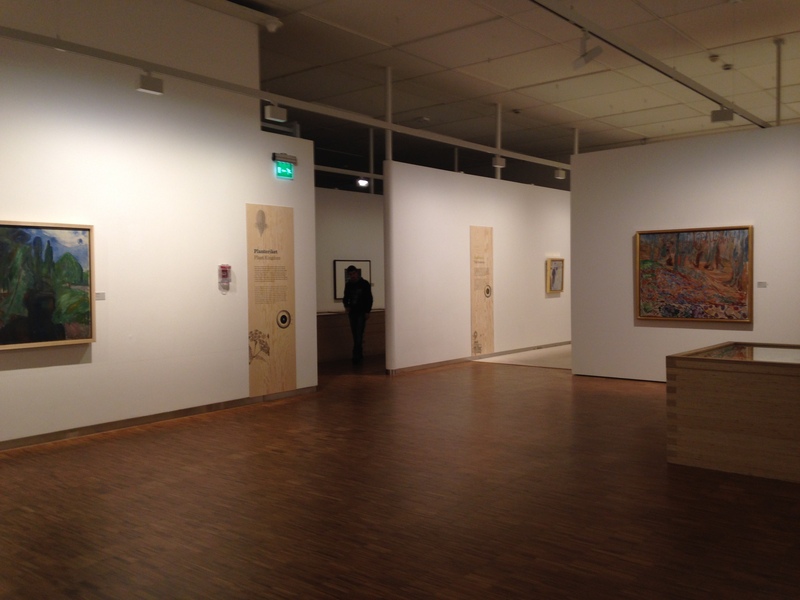 Things are also made more difficult for the conservationists because the museum often loans out Munch’s works. While sending Munch’s paintings out on tours helps generate money for the museum, it can be hard on the paintings since they can suffer damage when they are constantly moved about and put on display. In case you’re wondering why you aren’t allowed to take flash photography in museums, Alyssa told me that it’s because older paint tends to contain unstable chemicals. This means that they are reactive to light, so your flash photo is actually changing the color of the painting, and causing it damage. Additionally, conservationists still don’t have a complete grasp on all the things that can damage a painting. Alyssa told us that she used to work with someone who has been working for almost eight years on why cadmium yellow occasionally darkens over time. Alyssa also told us a bit about conservation philosophy and how it functions in Norway. Everything that conservationists do should be both reversible and visible. Things don’t necessarily have to be visible to the naked eye, but they should show up under UV light. Alyssa even showed us one of the paintings to demonstrate. To the naked eye the painting looked completely normal, but once it was put under UV light it was clear that a great section of the painting had been damaged and restored (unfortunately Kyle and I weren’t allowed to take pictures in Alyssa’s workspace so you’ll have to use your imagination for this). Furthermore, in Norway conservationists believe that paintings should not be restored. Conservationists simply try to prevent paintings from deteriorating further and try to preserve their current state. As for what Alyssa does, she is working a lot with Munch’s old paint tubes. Munch left everything he owned to the city of Oslo, even his hats, and that included approximately 1200 paint tubes. While many of these are from the brand Windsor Newton, their ingredients labeling isn’t always accurate. 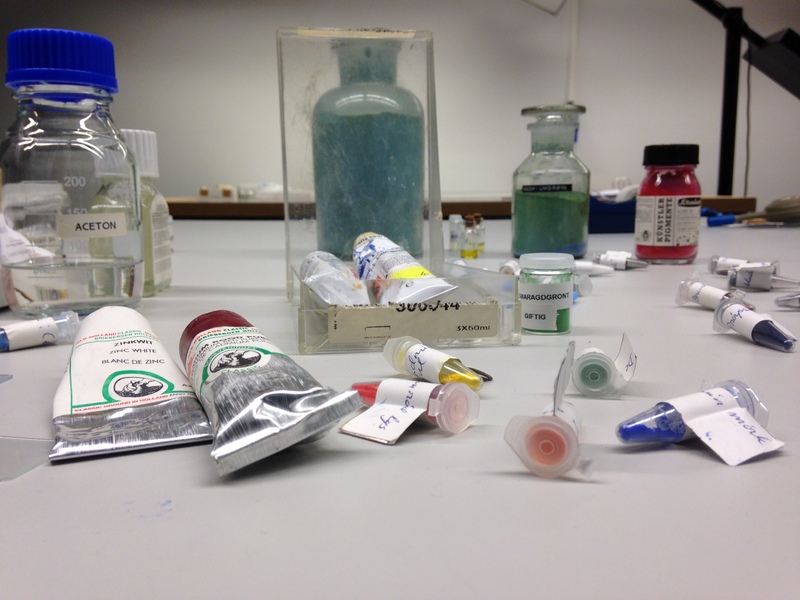 Alyssa analyzes these paint tubes as well as bits from Munch’s paintings and uses special instruments to determine what exactly went into his paint. The picture below is some of modern day paint that Alyssa occasionally uses as a baseline sample in her work. After patiently answering all of our questions, Alyssa showed us around other parts of the building. Unfortunately, Alyssa doesn’t have access to the museum’s vault of Munch paintings, but Kyle and I were pretty happy just to stand in awe outside of the vault door and stare at the retinal scan. She also showed us a hidden exhibit of Munch’s printing stones. Apparently the exhibit isn’t on display (and can’t be photographed) because of their reproducible quality. Since the stones are meant to mass produce Munch’s work, it would be incredibly easy for someone to take a picture of them and do just that–in short they present a copyright issue that the museum would like to avoid. Afterwards, we went to the museum itself. 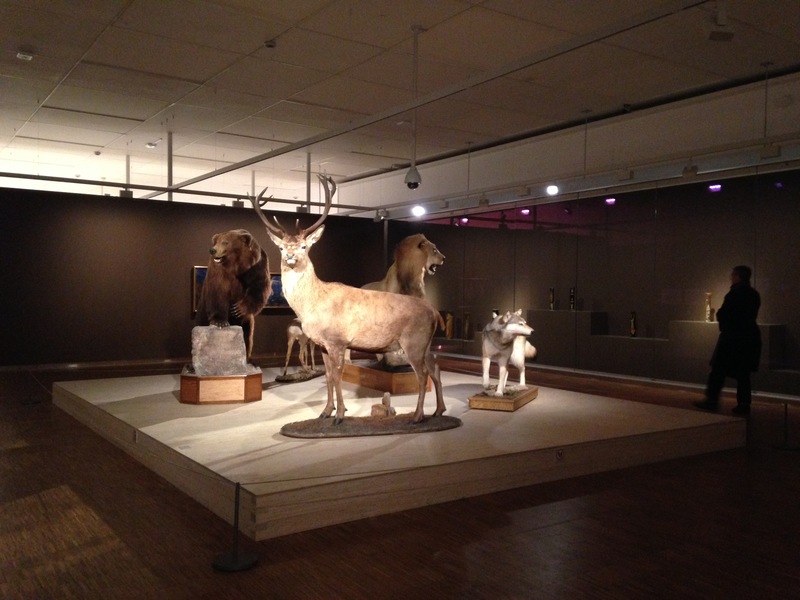 The museum currently has an exhibition of Munch’s work in conjunction with a natural history exhibit. The connection between the two wasn’t really well explained but I suppose it was still nice to see the two all at once. The museum itself is pretty small and took us less than an hour to go through, but I’m definitely glad that I went. Not only did I find Alyssa’s work pretty amazing but it was nice to get a better idea of what Munch’s work is like beyond The Scream.